This movie follows David Kim as he desperately searches for his missing daughter Margot. From that description it may sound like an ordinary mystery film, but there’s a catch: it’s told entirely through the perspective of a computer screen. This isn’t used simply as a gimmick but rather as a filmmaking tool to amplify the emotion and suspense. It’ll shatter your heart within the first five minutes of staring at a large computer screen projected in front of you, and FaceTime and text conversations are made interesting and thrilling. Though the concept is familiar, the plot is absolutely unpredictable and you can never tell what’s going to happen next. The way it builds up its conflict strongly pulls your interest and from there will find ways to always keep you guessing, as more shocking details are revealed that surprise the audience and put them on the edge of their seat. 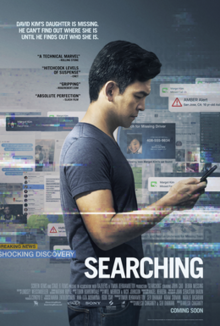 John Cho plays a loving father whose every action or reaction throughout his search for his daughter feels believable for what a father would do, and Cho displays range, emotion, and humanity in his leading performance. It’s amazing how much you can learn about someone from their computer — even when we’re not directly looking at him, we always feel for David and understand how he’s feeling through the whole film. The format doesn’t limit the film’s opportunities and works perfectly throughout the entire runtime. There is never a dull moment that allows you to take a breath from this gripping mystery until the very end. As an audience member you always feel forced to look for clues and details and invited to embark on this father’s journey through his device. The writer has so much to say in this film and the script works on many thematic levels — It’s about a father’s love for his daughter, about how secretive kids choose to be from their parents, how different generations use technology, and how much a computer can tell you about a person and their life. There’s so much to be analyzed and so much the director wonderfully conveys in 100 minutes. Searching is the original, creative, and enthralling thriller we need right now — it’s a shocking and unique thriller that will grip onto you and not let go until the very end. This entry was posted in Drama, Thriller. Bookmark the permalink. It was indeed a nice thriller!